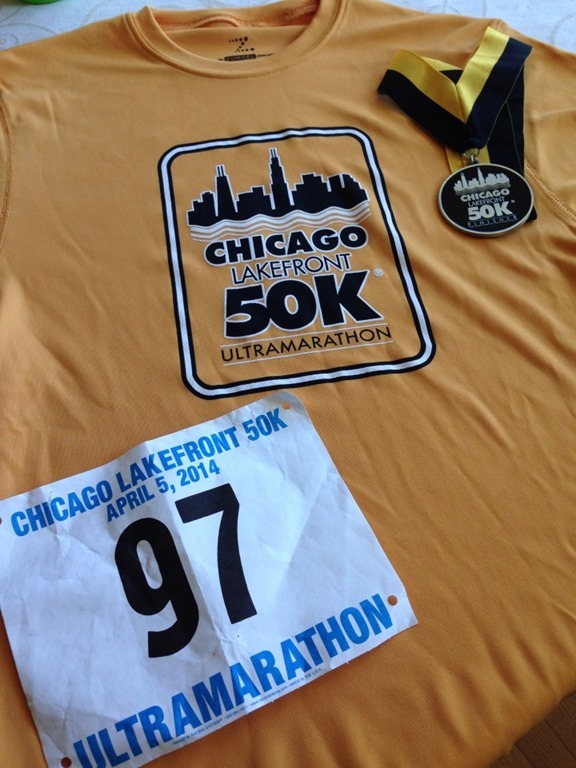 Saturday, brought us a beautiful day in the CHI and my 2nd ultra in the form of the Lakefront 50K. 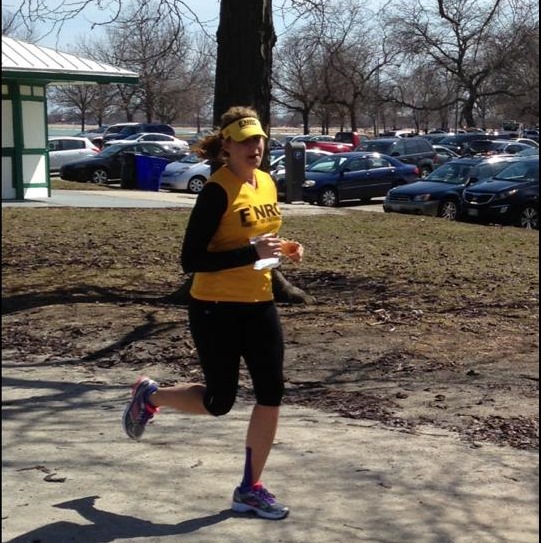 This was not a trail ultra but a nice flat event on Chicago’s Lakefront Trail. Great ultra for first timers or those worried about covering the distance because you are not isolated on some crazy trail out in the woods but constantly surrounded by other people, in a populated area. Plus there are three loops, so you actually pass by your car 3x. This could be viewed as a positive or a negative depending on how you look at it! But on the up side, you get to pass your friends over and over again, whether they are in front or behind you and that’s a BIG win in my book! The reason I signed up for this race was because my friends’ Mike (Run Nerd’s Rock) and Michelle (This Momma Runs – green shorts above) were running the event. I figured, “why not?” so I signed up! Then I later found out that several of the ladies from my running club (Frankfort New Lenox Running Club) were also signed up. This added to my excitement, despite my low mileage throughout March. And the bonus to running with Mike, when he is fast enough to literally run circles around the rest of us, is that we made let him take all the pics and we just focused on the run. So pretty much every pic in this post was taken by Mike. Thanks, Mike!!! 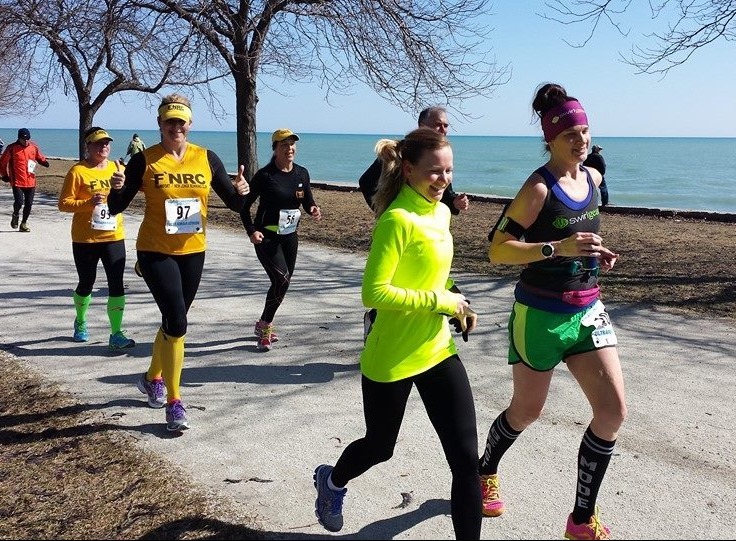 The springtime Lakefront 50K is 3 loops. It’s on the north side of the city, starts at Foster Avenue Beach in Lincoln Park and weaves south to the North Beach boathouse (then back). 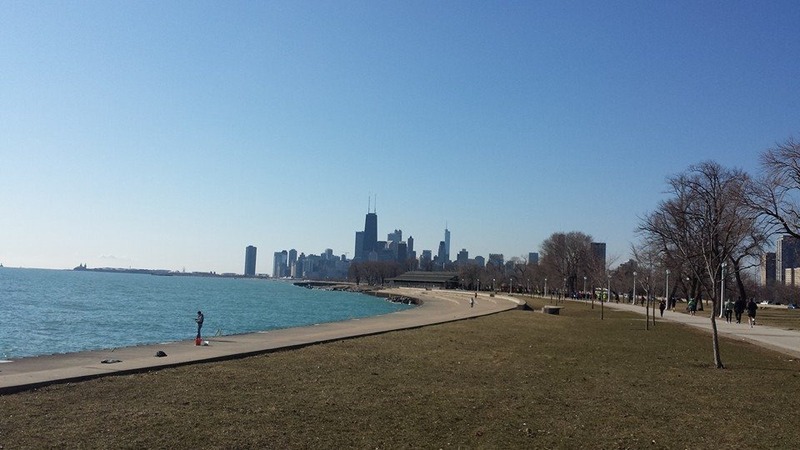 The start line was steps away from the lake; however, the Lakefront Trail ends on the north side of the city, just past Montrose Harbor. Therefore, it was necessary to weave thru a few parks on crushed limestone trails before hitting the actual paved Lakefront Trail which has made Chicago so popular. The route was marked VERY well with orange painted arrows. There was never a question about the course and I was super impressed by the meticulous attention to detail because I have been dropped from a CARA pace group lost in this area in the past. Aid stations were about every 2.5 miles. One at the start/finish. One at the midpoint of the loop. One at the turnaround. At each turnaround location, we had to check in and give them our bib number to ensure that we had ran the entire 3 loops. The aid stations were stocked with: water, gatorade, coke, sweet pickles, giant olives, twizzlers, yogurt covered raisins, m&m’s (with and without peanuts), goldfish crackers, potato chips, shoe string snacks, and bananas. I’m sure I’ve missed something but there was a lot of different options. Bathrooms at each aid station too. Plus we had a drop bag at the start/finish on a tarp which we could access each time we passed. Super simple. Super organized. Very well ran event. Plus we had the added bonus of breathtaking views of the city and Lake Michigan! This was a fun run. Not a race for me. Just a run in the park with my friends. 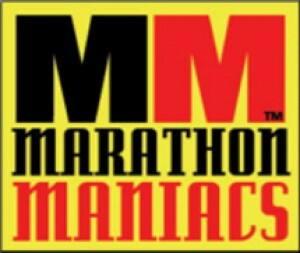 That’s how I approached it mentally and I tried to stay slow throughout so that I could finish strong. I won’t say the 3 loops weren’t daunting, especially at the beginning but by the time that third loop rolled around I was ready to be done and it was nice knowing that we “only” had 5 miles out, then back, to put it in the done column. I even had a little bit left at the end, which is nice when I can finish strong. I definitely feel as if I’m becoming a stronger runner, mentally as much as physically. Thanks to Marty & Jill who were waiting at the finish for the F’N Runners and caught this pic of me running to the finishing! 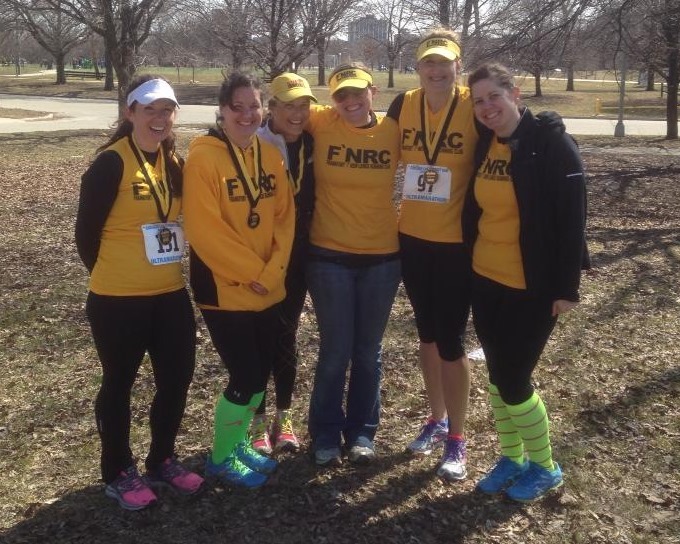 Some of the FNRC ladies after the event. 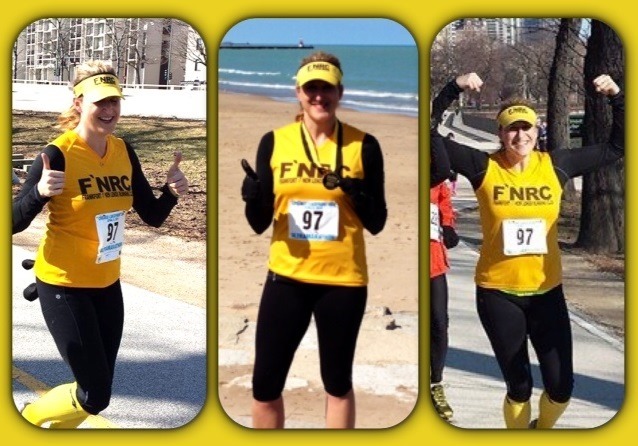 From left: Melanie (See Mommy Race – ran her first 50K!! 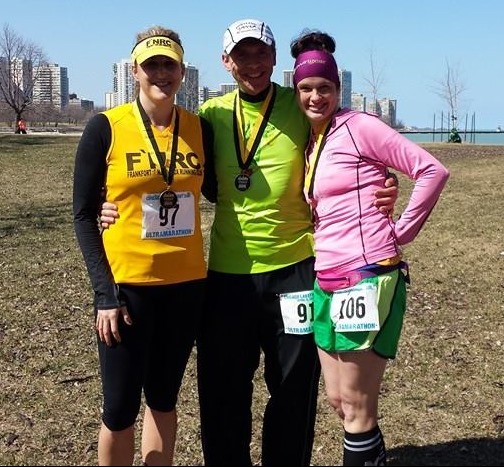 ), Julie M, Judy F, Jill Y (Jilly Runs – ran her 20 mile training run THEN came down to see her girls finish the ultra! ), Me & Amanda W (Get to Goal who supported us throughout the day!). I think I paid $55 for this race when I registered. Big bang for the buck. However, the event comes with a race “course” that is filled with extras. Everyone shares the trail with the local runners, bikers and walkers. Kinda cool but if you are in it to race it, then it might be annoying. And the bikers are fast and certainly irritated by the extra traffic on the trial. Other than the bikers, everyone was super supportive and it really was a great day!